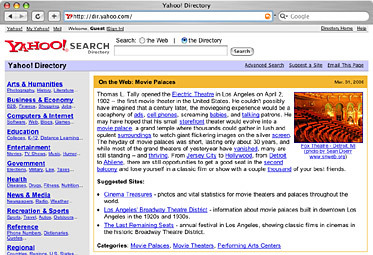 Yahoo is featuring Cinema Treasures, along with a photo by Cinema Treasures user and volunteer Sean Doerr, on its Yahoo Search Directory homepage. “Love the Movie Palaces front page feature, but please do a little more research before making statements such as "Thomas Tally … opened the first movie house in the USA in 1902.” This is just not true, as the experts at the Theatre Historical Soc. of America ( www.historictheatres.org ) could have told you. Relying on any one local source is always going to get you their bias or simple ignorance of the nation as a whole. People viewing that page will tend to take your word as authorative fact, so you owe them more than just someone’s opinion in California, just one of 50 states after all." Nice to see that the word is getting out about CT!